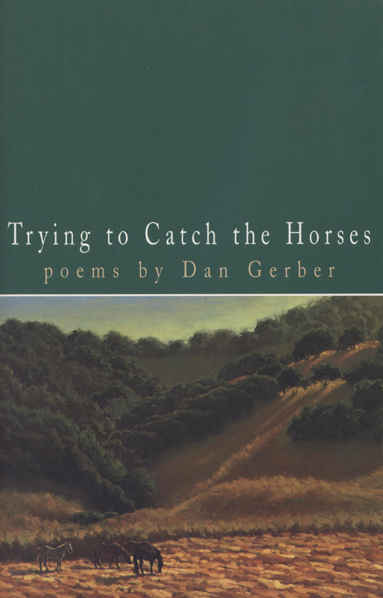 Dan Gerber's Trying to Catch the Horses is his first full-length collection since his highly acclaimed selected poems, A Last Bridge Home, published in 1992. Many of these fifty-eight poems have appeared in the finest literary magazines and anthologies, including Poetry, New Letters, The Ohio Review, and The Best American Poetry 1999, selected by Robert Bly. Long recognized as a meditative poet with an almost mystical connection to animals and the natural world, Gerber begins this collection with a quote from Buddhist monk Thich Nhat Hanh: "Contemplate seeing your bodily form present before you—in the trees, the grass and leaves, the river." In the manner of Rilke and Juan Ramón Jiménez, Gerber's unadorned poems are acts of discovery, inviting us into a place deep within ourselves through a conversation between human consciousness and the consciousness of things. In the title poem "Trying to Catch the Horses," the poet achieves his apparent goal not through will or ambition, but by letting go, to become "a clump of grass they (the horses) must graze," and to reach up and touch "the sky itself as far as it goes." In two of the book's most riveting poems, Gerber focuses his imagination on both our century's World Wars, envisioning a burst of shrapnel as a flight of blackbirds, and questions the entire enterprise of a great battle in the Pacific and how "we never thought / of fish in the sea and how / this was their home though not their war...."
Whether Gerber writes about horses or war, hiking a canyon or encountering a wolf, his backdrop is a profound silence against which these poems become necessary song. Dan Gerber was born and grew up in western Michigan and received his bachelor's degree from Michigan State University in 1962. He has worked as a corporate executive, an automobile dealer, a professional racing driver, and a high school teacher. From 1968 through 1972, with Jim Harrison, he co-edited the literary magazine Sumac. He has traveled extensively as a journalist, particularly in Africa. He has been writer-in-residence at Michigan State University and Grand Valley State College and has lectured, read, and taught at numerous colleges, universities, libraries, schools, and museums throughout the United States and England. He and his wife, Debbie, divide their year between central California and southeastern Idaho.Dan Gerber has published three novels, a short-story collection and six books of poems, including A Last Bridge Home; New Selected Poems and Trying to Catch the Horses. He was the recipient of the Michigan Author Award in 1992, had work selected for inclusion in Best American Poetry 1999, and received the Mark Twain Award for Distinguished Contributions to Midwestern Literature in 2001.